Custom designed for Samsung Gear S3 Classic / Frontier Smart Watch. The buckle is made of high-end steel, matte design and not rust. Metal adjustable buckle clasp is ready for band interchange. 9 Pin Holes for fine tuning and comfortable wearing. - Designed specially for Samsung Gear S3 Classic / Frontier Smart Watch. - Made of top genuine leather with stainless metal clasp buckle, a great craftsmanship, elegant and luxury. - Trusted stainless steel metal clasp buckle ensure the stability, easily to install / remove, multiple alternative holes for adjustable length. 1. Tracker is NOT included in package. 2. Swees is a registered trademark and brand in United States and protected by US Trademark Law. Swees, reserves the right to pursue legal responsibility for the abuse of Swees trademark. 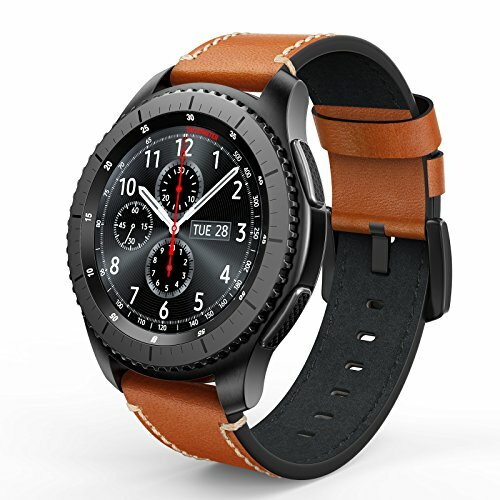 Personalize your Gear S3 watch with this stylish leather strap, offers a comfortable fit and classic look to you.